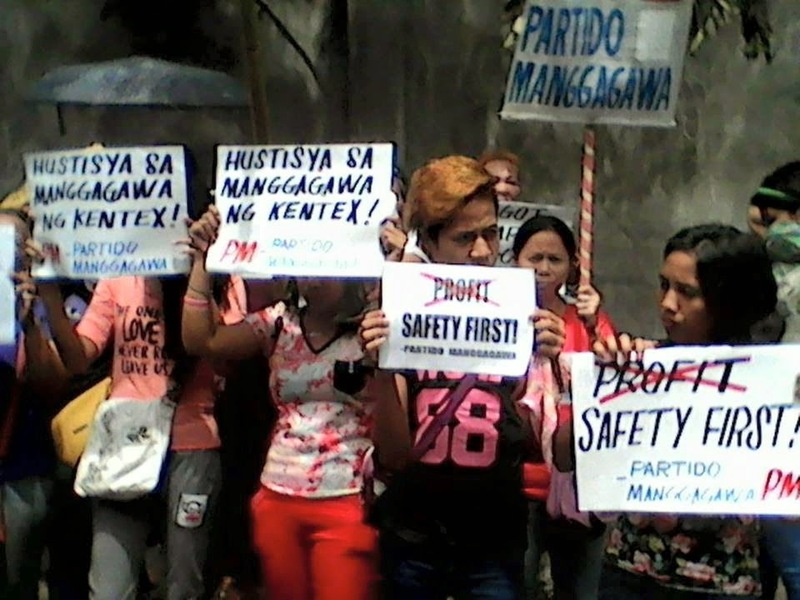 The militant Partido Manggagawa (PM) is calling for the criminal prosecution of the owners of Kentex Manufacturing and its subcontractor CJC Manpower Services. To highlight this call, some 50 PM members will troop this morning to the main office of the Department of Labor and Employment as Labor Secretary Rosalinda Baldoz summons the representatives of Kentex and CJC for a mandatory conference. “Workers who are caught jaywalking can be jailed. The owners of Kentex and CJC deserve no less a penalty for the massacre of some 70 workers and injuries to dozens more. The owners of Kentex and CJC are not just immoral but criminal. Justice for Kentex workers cannot be served by giving P13,000 in assistance to the families,” declared Wilson Fortaleza, PM spokesperson. PM vows to continue pressing for justice for Kentex workers who were killed and injured in the factory fire last week. Earlier, PM together with the Nagkaisa labor coalition held a candle lighting protest at the Kentex factory. More actions are slated for the coming days. As Secretary Baldoz called on Congress to put “teeth to the law” by passing pending legislative bills providing for criminal penalties for violations of occupational safety and health standards, PM challenged the DOLE to use its existing visitorial and enforcement powers to inspect establishments to prevent another workplace tragedy. “Obviously we welcome criminalization of the breach of workplace safety. Still what the DOLE lacks is political will not enforcement powers Article 128 of the Labor Code already empowers the Labor Secretary or her representative to investigate any fact, condition or matter which may be necessary to determine violations or may aid in the enforcement of labor laws,” Fortaleza insisted. “Kentex and its illegal subcontractor CJC are both small fry. As far as illegal and immoral forms of contractualization is concerned there are bigger fish out there. We have been campaigning already against Asiapro, the biggest supplier of contractual workers in the guise of a labor cooperative. And everyone knows the endo system at SM. But the DOLE has not lifted a finger in these cases,” Fortaleza ended.